Spring has FINALLY arrived in the Northern Hemisphere, and I am very glad to be enjoying warm days, again, and seeing so many flowers in bloom! It's not long, now, until school will be out for the summer. Do you have any exciting holiday plans this year? We've already had our big trip to New Zealand, of course, but we still hope to get away for a couple of long weekends, here and there. One place on my list of future summer holiday destinations is definitely Cornwall, in South West England... you could say I became particularly interested in the region once I began watching the BBC's 'Poldark' a few years ago! ;o) The scenery looks truly breathtaking and I began browsing through all sorts of travel photos online - I was very inspired! I am very happy with how this scene has turned out and if you'd like to stitch it yourself, you can find the pattern in the June 2018 Issue 268 of The World of Cross Stitching magazine, which is currently on sale in all the usual places. Here it is! 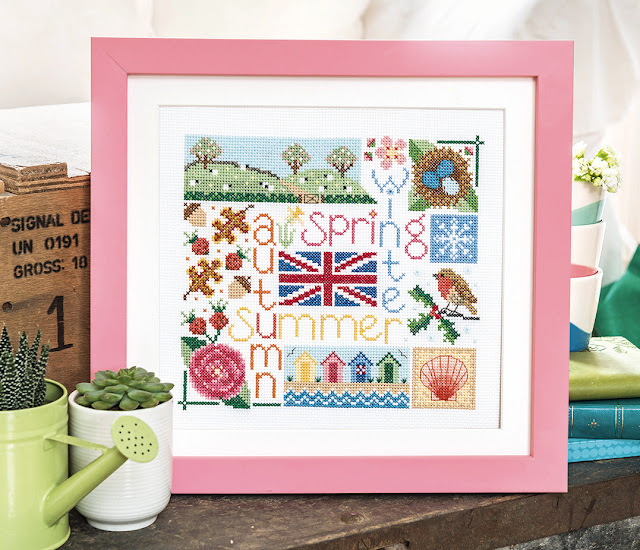 :o) Published in the April 2018 Issue 266 of The World of Cross Stitching magazine, it is actually one of my largest designs, so far. 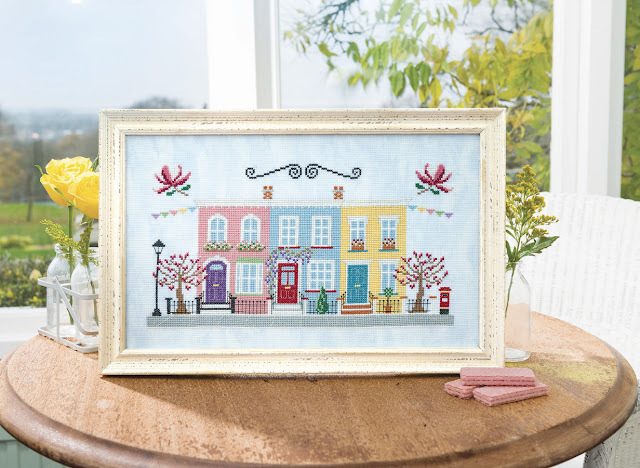 It is a sweet, spring themed street scene ~ inspired by fancy London neighbourhoods full of pretty painted houses with overflowing window boxes! Not to mention all the magnolia trees and wisteria vines, laden with flowers, that have become such a stunning feature in those areas every year. 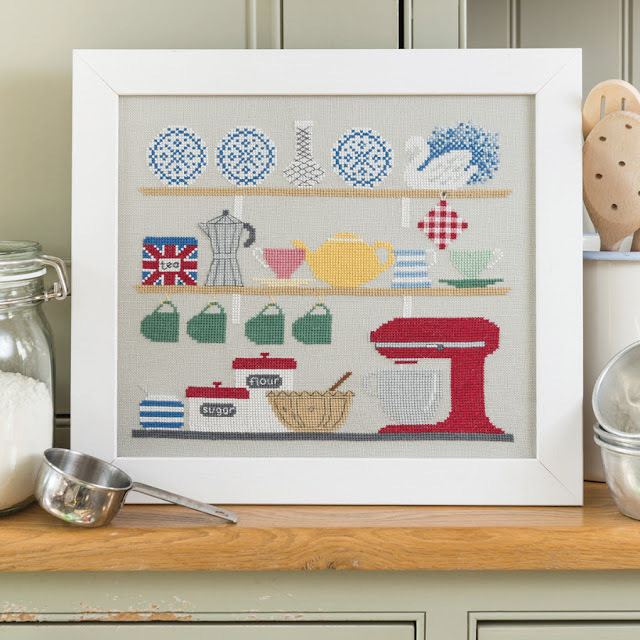 Take care and as always - happy stitching! 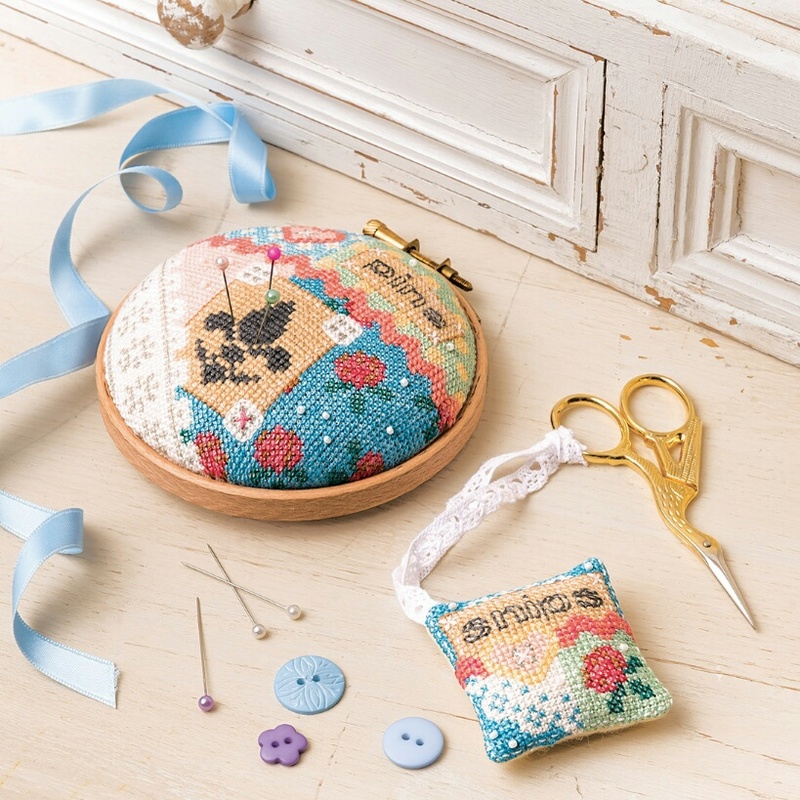 Have you checked out the Handmade With Love Super Bundle, yet? There is so much inside that I think you would enjoy - I’m absolutely thrilled to be a part of this bundle and all the handcrafting goodness it contains! What better way to start your weekend? With over 200 patterns and step-by-step tutorials inside, you’ll find so many new projects to create, ways to sharpen your skills, or even learn a whole new technique! The bundle covers everything - quilting, sewing, applique, crochet, knitting, embroidery and cross stitch - of course! ;o) - plus other fiber arts such as dyeing and weaving. Just visit the Ultimate Bundles website if you want to find out more about the bundle, then click the pink 'GET MY COPY NOW!' button to go through their simple and secure 3-step checkout process. You’ll receive an email with a login to their online access portal, where you can download your eBooks and patterns. Use their Getting Started Guide to pick the project or technique you want to try your hand at first and start creating! Hope you are all well! 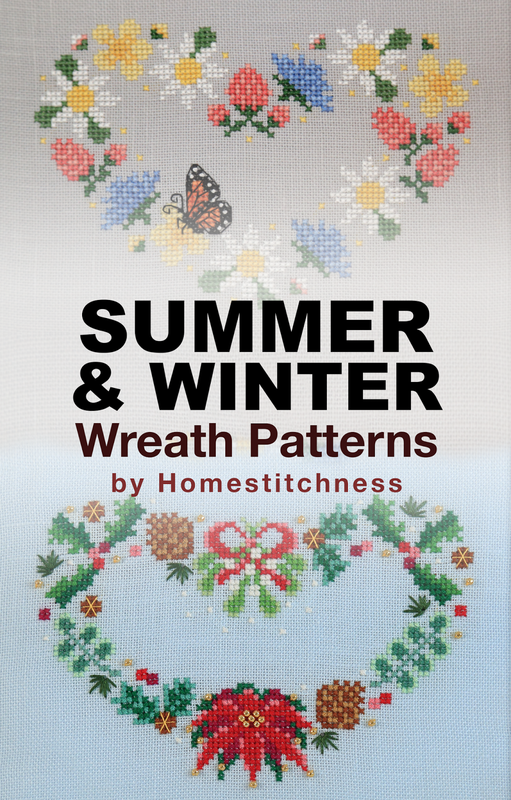 :o) The snow is about ready to fall here in the Northern Hemisphere, meanwhile those of you in the Southern Hemisphere are getting ready to relax over your summer break... whatever season it is in your neck of the woods, I'm sure you've got plans to spend lots of time crafting! 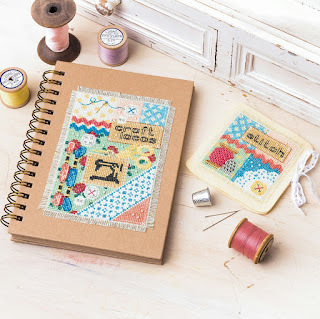 :o) I am really excited to tell you about a collection of digital craft resources that I was invited to be a part of - it’s called the Handmade With Love Super Bundle and it has been created with you in mind! 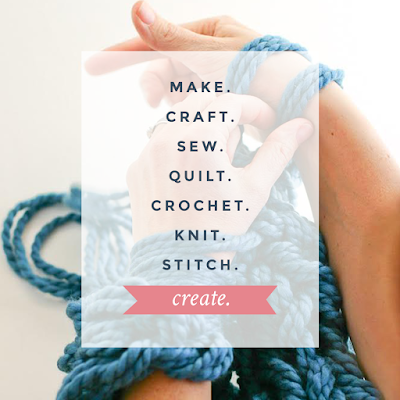 I’m thrilled about this bundle and all it's handcrafting goodness! 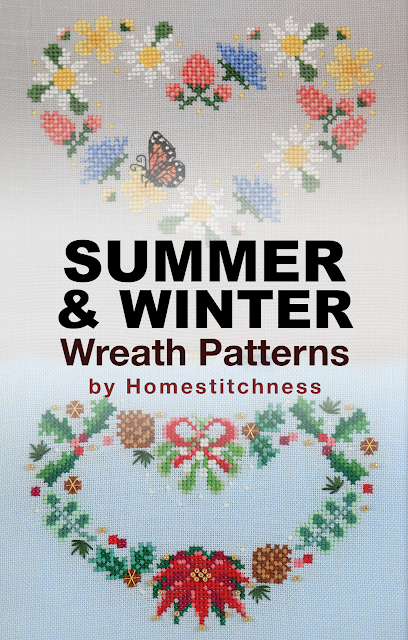 With over 200 patterns and step-by-step tutorials - including my Summer and Winter Wreath patterns pictured below - you’ll find so many projects to create (not to mention new ways to sharpen your skills, or even learn a whole new technique!) 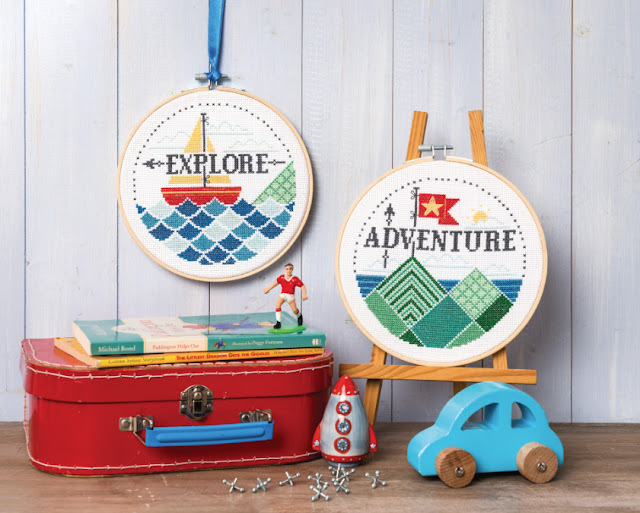 This bundle covers everything from quilting, sewing, applique, crochet, knitting, embroidery and cross stitch to fiber arts such as dyeing and weaving. Honestly, it truly is every crafter’s dream package! Take a look at the images below - you’ll get all these delightful projects for just $29.97 (the total worth is over $1,000!) then visit the Ultimate Bundles website and click the pink 'GET MY COPY NOW!' button to go through their simple and secure 3-step checkout process. You’ll receive an email with a login to their online access portal, where you can begin downloading your eBooks and patterns, signing up for your online courses, and redeeming your free bonus offers. 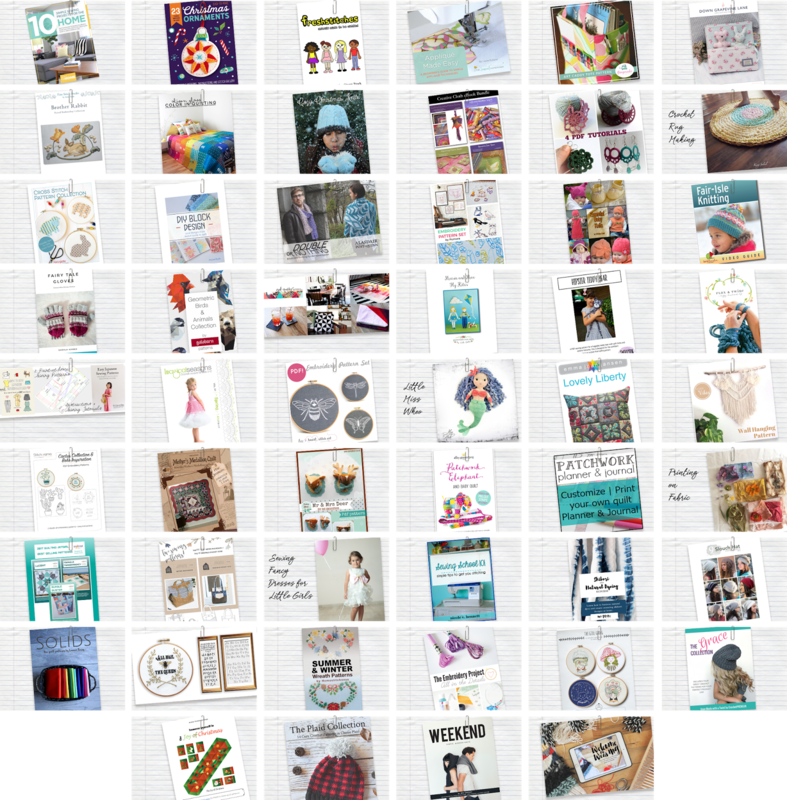 Use their Getting Started Guide to pick the project or technique you want to try your hand at first and start creating! The most important detail is that this bundle is available for just 8 days! After Monday night, December 4th 2017, the sale ends and you’d have to buy all of these products individually. The offer is backed by a 30 day full money-back happiness guarantee, so you can make sure it’s right for you. The customer service at Ultimate Bundles is amazing - the staff really want to make sure you’re taken care of and that you love your bundle. So, if you’re ready to spend more time making and unplugging from technology like I am, this package is exactly what you need. 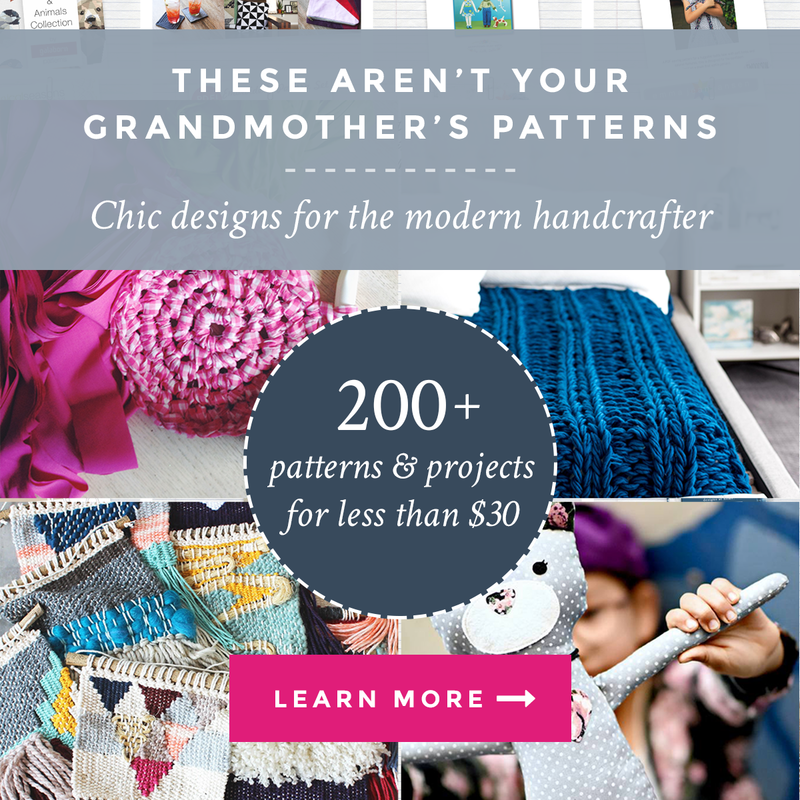 You can create one-of-a-kind items to wear, gift, decorate with, and simply enjoy, with this curated, convenient, and super affordable library of patterns and projects. Learn more or get your bundle here. I truly hope you enjoy the Handmade With Love Super Bundle! I must say, it does feel good to be dusting away the cobwebs from my blog and writing posts once again. Can you believe it is November already!?! The pumpkins are now disappearing and Christmas decorations are starting to take their place... I haven't decided when I will put up our Christmas tree, yet. As much as I like to make my autumn decor last through until after Thanksgiving, it's a funny time of year as it really starts to feel a lot more like winter than fall. 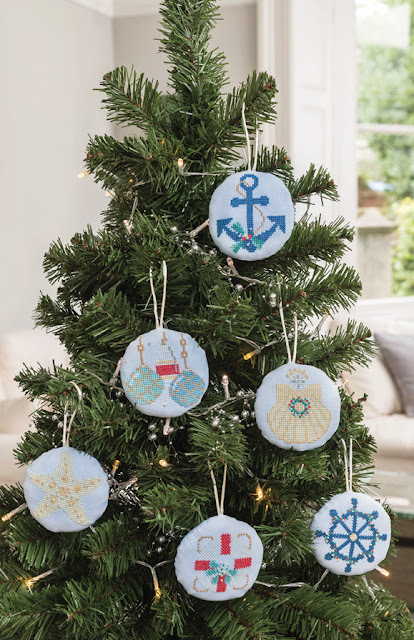 I am excited to tell you about my latest collection of designs published in the latest December Issue 262 of The World of Cross Stitching magazine - a set of six Nautical Christmas Ornaments! Having grown up in New Zealand, where Christmas is a summer holiday, I still like to reminicse over warm days spent at the beach at this time of year. It was quite an adjustment for me, getting used to celebrating Christmas in the winter, and I still like to decorate our home with both winter and summer themed ornaments. This collection, to me, is a perfect mix of both! 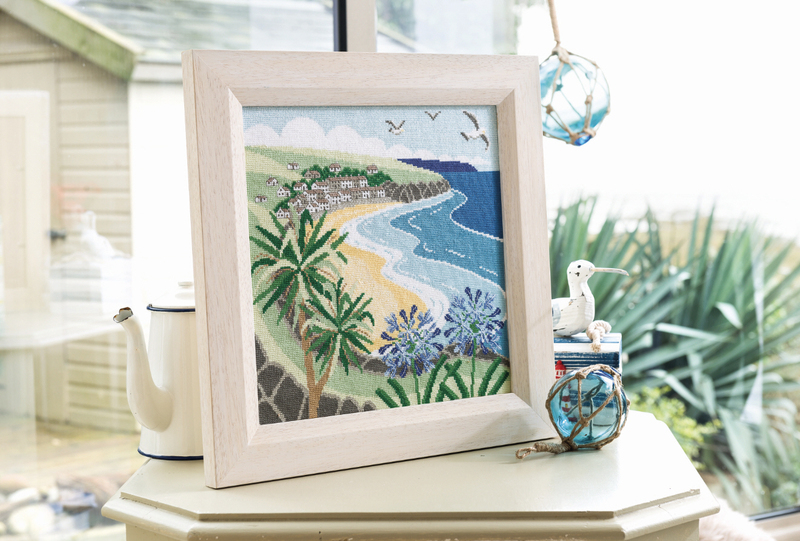 And not only that, they are perfect for the many stitchers who live near the coast. I am eager to get started on stitching these, myself - I think I might hoop them up for our tree with some red pom-pom trim! 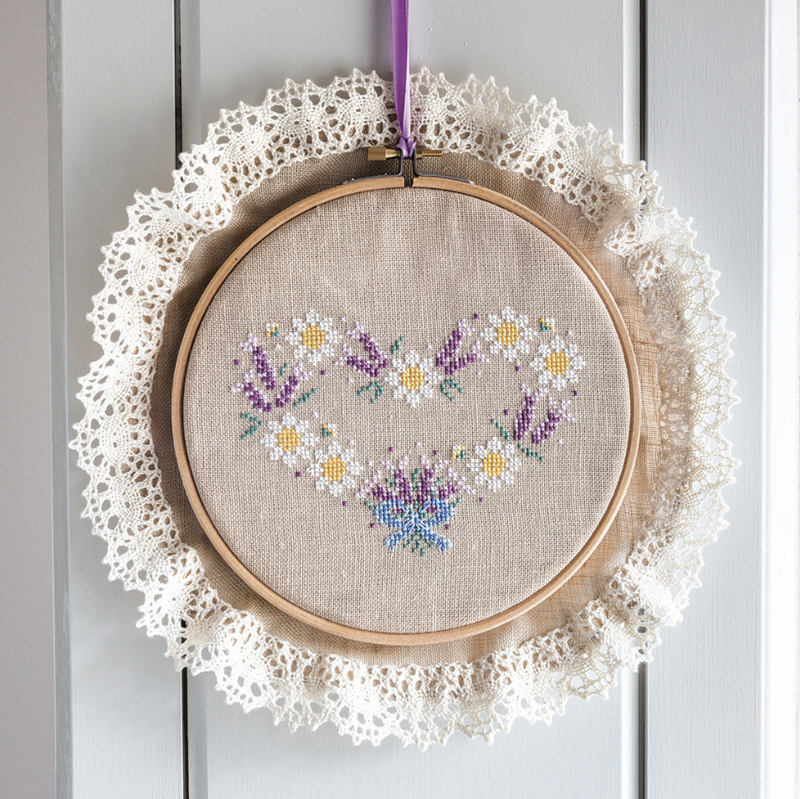 Next up was another variation in my collection of floral heart designs, a pretty 'Lavender and Daisy Wreath' published in the August 2017 Issue 257 of The World of Cross Stitching magazine. 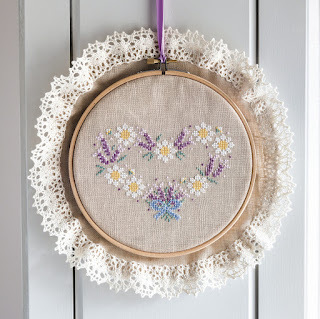 I especially love how beautifully the team at WOXS finished the model in French country style - the lace framing the hoop is absolutely gorgeous and the purple ribbon literally 'ties it all together'. These floral hearts are such a joy to create and continue to be very popular! The October 2017 Issue 259 of The World of Cross Stitching magazine featured my set of four 'Sewing Accessories' including a pincushion, needlebook, scissor fob and notebook cover. I love the soft, layered look of each piece and I enjoyed 'scattering' some pearl beads across each notion to add to the pretty 'antique' style of the collection ~ I think they turned out really well. 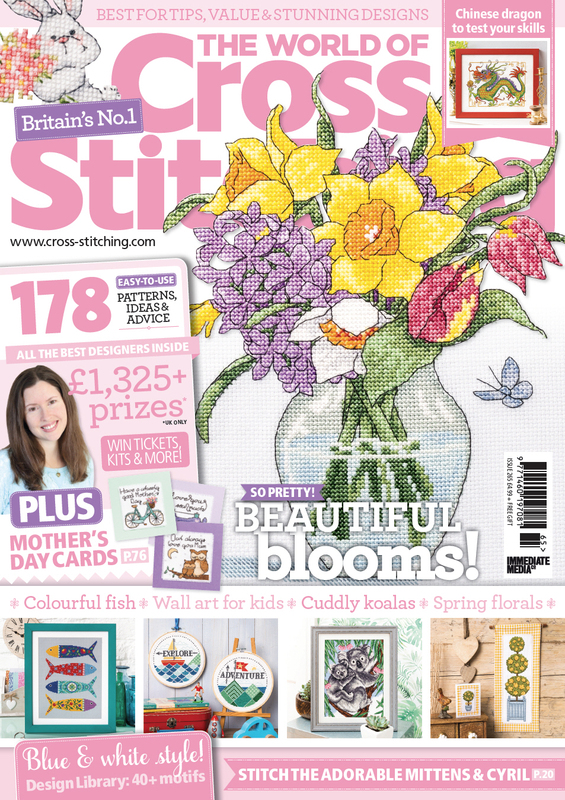 And, most recently, I designed these two lovely autumn posies for the November 2017 Issue 260 of The World of Cross Stitching magazine. 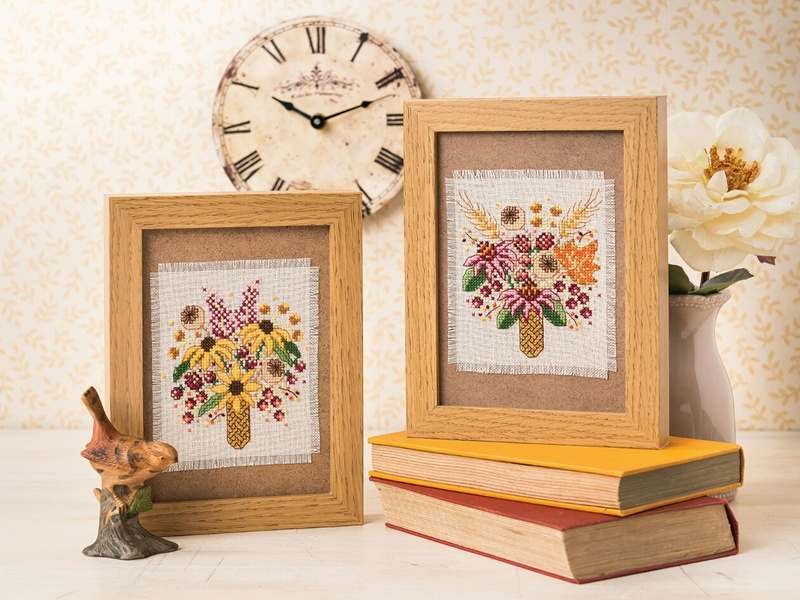 These designs celebrate the classic blooms we all identify with late summer/early autumn - the colours are rich and vibrant and they make the perfect pair of stitched decorations for the season!